Brilliant, hilarious concrete recordings from 1966 -- the only document available of Roehr's audio works. German language, but not that is not an obtrusive factor for general enjoyment. (For remixes of Roehr's work, see the Whatness label). "Original recordings by the artist, writer and musician Peter Roehr, who died in 1967 at the age of 23. Like contemporary artists and writers such as Andy Warhol and William S. Burroughs, Roehr experimented with the principles of cut-up, serialism and montage, but unlike them he was working with those principles in almost all available media: film, text, visual arts and music. 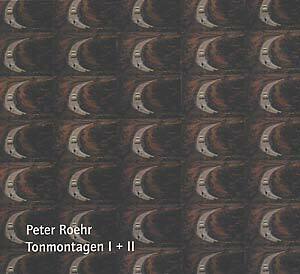 For the first time the publisher Supposè (Cologne) makes original recordings by Peter Roehr available -- montages he made in 1966 with material from German Broadcast and American commercials. Stunning and highly entertaining archive recordings and a simple must for everyone interested in the history of soundart and experimentalism. Comes in digi-pak with design by Peter Roehr, compiled by Klaus Sander (Supposé) and Frank Dommert (Sonig)."